For an older beginner, there is a narrow window of interest and if these students do not progress at a rate that meets their expectations they inevitably quit. There are ways parents can help older beginners achieve their musical goals. Make certain the instrument used for practice is adequate. Pianos for beginning students have never been more affordable. A new digital piano with weighted keys and a sustaining pedal can be purchased in Macon for $500 to $600. ** (See info below). Students and parents set specific goals for the next four, six and twelve months. Well planned goals lead to greater success. Setting realistic, achievable goals helps an older student recognize his or her progress. Often it is best to set short, middle and long term goals. Short Term Goals: Pass at least one assignment every week this month. Learn to play the primary chords in the key of C and their inversions this month. Middle Range Goals: Learn my favorite Christmas carol before our family visits in December. Finish the assignments in this method book before this year ends. Play my first classical piece at the spring recital. Be specific and break down middle and long range goals to make certain they've achievable. How many pieces of music will have to be passed each month to finish that method book before January 2015? Consider the number of pages in the book and if the goal needs to be changed to February instead of January. Is there a favorite piece of classical, worship, Broadway, or popular music your student would like to play in six months? Send me a U tube link or another online source and the title. I'll work with students to do what is necessary to learn that new piece whether we purchase music or learn to play it by ear. Discuss the potential obstacles that could hinder progress over the coming months. How much practice will it take to achieve each goal? Is current practice adequate? Are there ways to find more time to practice or to improve the quality of practice? Practicing consistently 20-30 minutes a day, 5-6 days weekly, many older beginners are able to play simple versions of their favorite music within six months or less. Daily practice for 20 minutes yields far better results than practicing an hour, right before the lesson. New students often HATE to count out loud…until they do it long enough to discover that they learn new music a lot faster and it is actually easier to play. It takes time to internalize the steady beat and those who count out loud achieve the best results in the least amount of time. Students who rarely miss a lesson are more motivated to practice. Students who miss one weekly lesson a month lag far behind those who attend on a weekly basis. 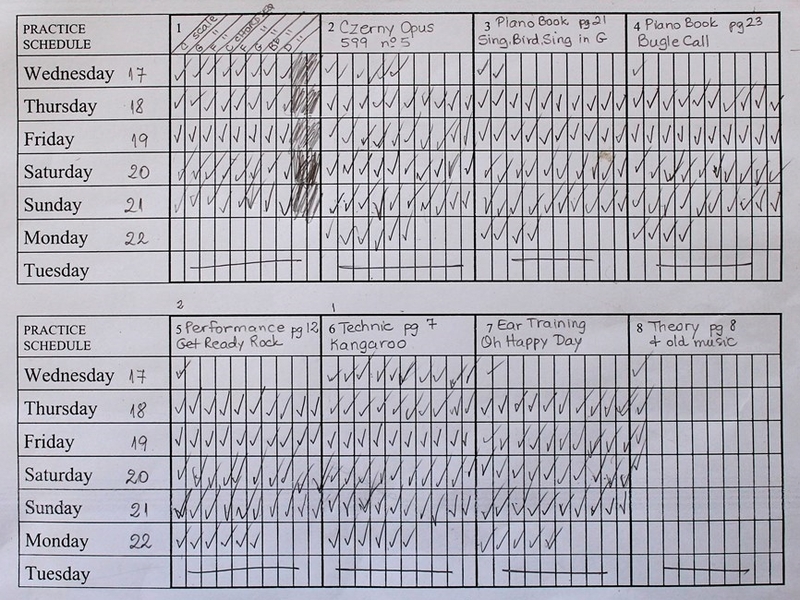 It takes two weeks of lesson attendance to get a student back into the habit of daily practice once they miss a lesson. During that time, they forget instructions and practice things incorrectly. Suddenly, what was fun is no longer fun. 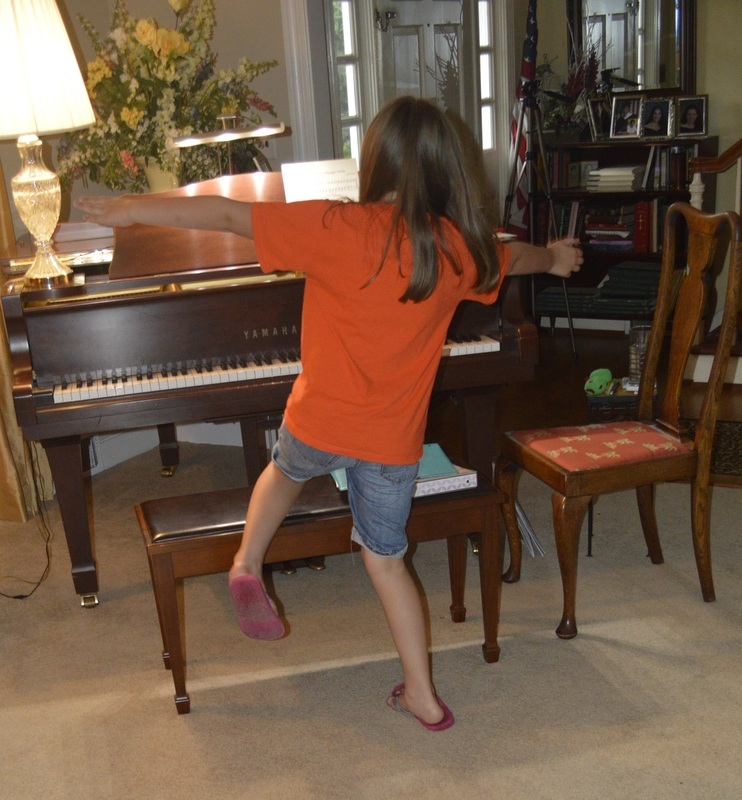 Piano has become hard work and they hate to practice. The more often this happens, the harder it is to keep them motivated. Routinely missing lessons is often the root cause when students lack motivation. My answer: Ideally, practice should be long enough to achieve realistic goals and short enough so that students want to go back to the piano later and explore on their own. If I overload them with too much in each weekly assignment, it destroys that desire. When a student practices their assignments and then goes back later to play, just for fun, I know they've taken ownership of their music. This is when true learning and creativity begin. My goal is to plan and teach their assignments in a way that keeps them motivated and always wanting more. Even my youngest students can benefit from setting goals. If you want more info, let me know.